This blog series has been brewing in my spirit for months. I kept putting it off and never got down to writing because I felt that it would be rather duplicitous of me to write about something that I haven’t fully “got right” yet. But I was reminded that I don’t have to “have it together” all the time – I am not supposed to draw others towards me, but to invite them to follow me as I follow Jesus. Therefore I call for my readers to read this series with this fact in mind: The battle with fear is still an all-too-real struggle for me. I do not write this with flippancy from the vantage point of “Been there, done that”, but as a fellow pilgrim/sister/friend/comrade who is still learning to overcome. Fear is a four-letter word. It really, really is. I have battled with fear all my life and have found it to be a shape-shifting beast. It takes on the form of many things – stage fright, shyness to make friends in school, insecurities, fear of failure, fear to give and receive love, etc. – but behind the assorted facades is the same stinking fiend. This brute’s latest guise made its appearance in my relationship with Alex. Contrary to the trend of most young women, I love singlehood and I have never been afraid of “being left on the shelf”. Rather, one of my greatest fear was getting into a relationship leading to *gasp* marriage – that was the major Fear, with lots of little minions of little fears attached to it. When God made it very clear that Alex was the one He had chosen for me (I might eventually write a series on our story), I said “Yes” because I love God, I know He has the best plan for my life… and you just kinda do not question the wisdom of the King of the universe. Obviously, I knew that this relationship came with changes – most significantly my “never get married” plan, which I had boldly declared to many people. What I didn’t know was that my Abba Father, in His great love for me, refused to allow me to remain under fear’s power much longer. Instead, He was going to have me face this long-standing adversary, using my relationship with Alex as the means with which He drew me out of hiding. It has been a journey, and I am so thankful for Alex who has been ever so patient and gentle with me in the midst of the mêlée. One day as I prayed in despair of ever triumphing over the fear that loomed over me like a mountain, the Lord spoke to me about Proverbs 31:25. God’s Word is like a mirror that we can peer into and examine the condition of our heart; I peered into this mirror and saw that my life was not quite in line with what was written. 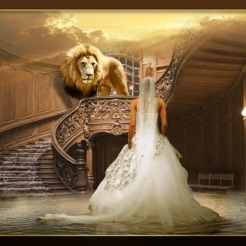 Proverbs 31:25 says that the woman of virtue “laughs at the days to come,” but wait just a blooming minute now… why in the blazes am I terrified of the days to come?! Thus began a learning process for me, and the birth of this blog series. 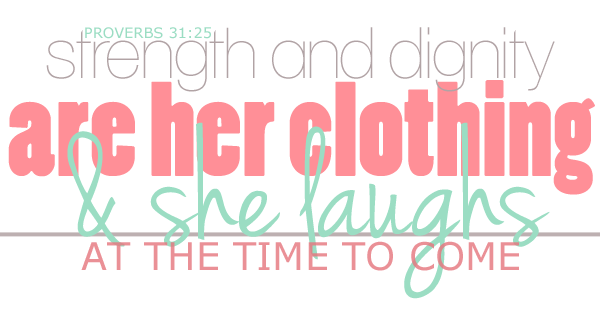 This series is based on Proverbs 31:25 “she is clothed with strength and dignity, and she laughs at the days to come”. This is the inheritance of ever daughter of the King, but so many girls struggle with fear, insecurities, and the unknowns of the future. I have gathered a panel of women whom I know and have observed up-close over time, who possess an innate peace and contentment regardless of their circumstances. These women are from different walks and in different seasons of life, but with one startling similarity: They always seem to trump worry with peace, fear with joy. It is with great excitement that I introduce these women to you through a series of interviews. Stay tuned for the first one, coming your way real soon!